✔SUPPORTS ALL SMARTPHONES TABLETS: which has a flatback, with enough size to fit a credit card. Compatible with all smartphones with a minimum size of 4-inch LCDs or larger such as the iPhone 4 / 4s / 5 / 5s / 6 / 6 plus / 6s / 6s / 7 plus/ 7/8/8plus/iphoneX, Galaxy S2 / S3 / S4 / S5 / S6 / S7/S8/S9pLUS, Galaxy Note 1 / 2 / 3 / 4 / 5 / 6 / 7/NOTE8, LG G2 / G3 / G4 / G5, HTC M8, iPod Touch , Sony Xperia, all iPads including iPad Air, Galaxy, Surface Pro, and so much more! ✔STRONG MATERIAL: The card holder is made of high quality, anti-slip material. This strong and durable material will keep its shape and cards will not fall out. High quality 3M strong adhesive on back of your cell phone,but no sticky residue when removed. 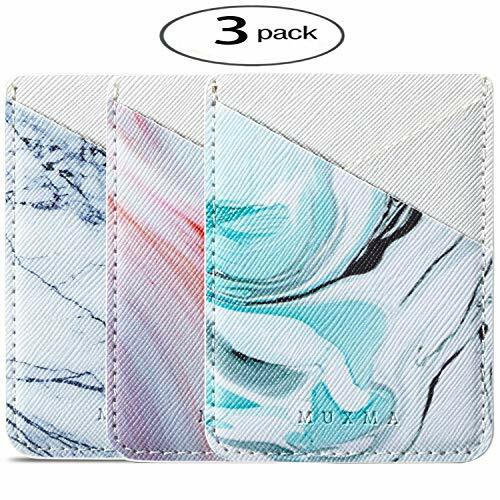 ✔UNIVERSAL SIZE: fit up to 2 cards comfortably, such as: ID card, credit cards, driver's licence, business cards, membership card, insurance card, discount card, business card, frequent flyer card, etc. ✔SOLUTION TO A BULKY WALLET; LEAVE YOUR PURSE AT HOME: No more need for a bulky wallet or purse. Just slip your credit cards, ID and some cash into the card holder and you're ready to go! Peel off the cover of the sticker and stick to your phone back, and finish by softly pressing. If you have any questions about this product by Heast, contact us by completing and submitting the form below. If you are looking for a specif part number, please include it with your message.